- The nature of the Nine Divines should be explored further in the mainlands Imperial Cult questline. I consider the Imperial Cult important and distinct enough from the rest of the Imperial government to be handled in its own thread. Note that an old idea was to have the nine divines who didn't make an appearance on Vvardenfell make an appearance on the mainland. This idea was specifically discarded, mostly as it would lead to shoe-horning divine avatars into places they don't belong and aren't needed. There were a few other ideas discussed for the Imperial Cult which I'll get around to fishing out later. Concerning faction relationships, or NPC reactions towards members of other factions. In another thread I started drawing a table to determine faction relationships with other factions, which has changed a few times since the first sketch. The table shows NPC reactions towards members of different factions. The table should be read by finding the source faction on the left hand column, and matching it with a faction from the top row. See the table in the spoiler below. First of all, in those graphs, I think the vertical columns are really the most important. They show how the opinions of members of factions change upon the player joining a certain faction. Always remember that faction relations are inherently player-centric. The player will probably never join Her Hands, for instance, so figuring out what other factions would think of Her Hands would mostly be a waste of time. Figuring out what Her Hands thinks (if anything) of other factions is, however, very important. Truth be told, I think it might be more reasonable to just figure out the vertical columns in the individual faction threads. This would split the task into bite-sized portions, allowing for proper discussion, and it would be rather easy to then go through the faction threads and gather the results. Per Gnomey’s advice I am now splitting this up through the faction threads. Please discuss in this thread the reactions of other factions towards the IC to keep things organised. 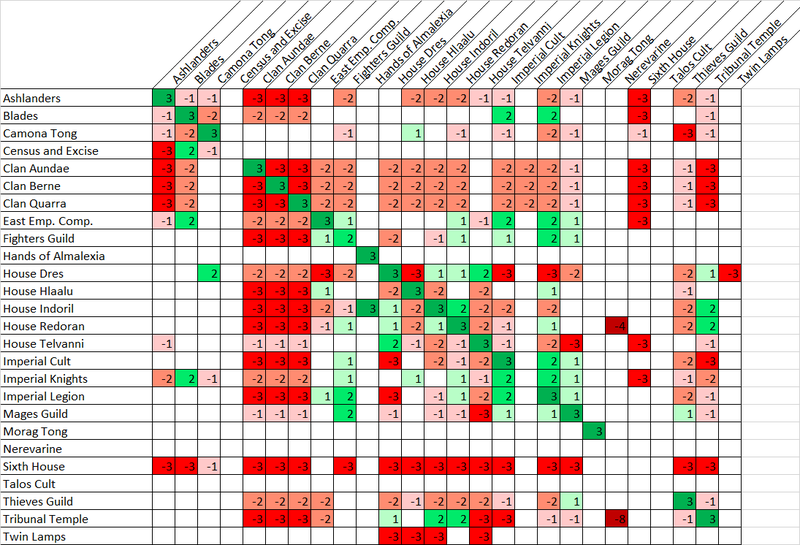 The IC relationships seem quite solid in the table. But, as their role in TR isn’t yet clear they should be open for discussion. What I am curious about is the locations of IC shrines, especially those purposed for Divine Intervention. I stumbled over this old thread concerning Imperial Cult oracles, which I think is relatively short and worth a read. I'm still not quite sure where we're planning to go with the Imperial cult; we have the standard almoner/sergeant/healer set-up, and we know we want to explore the nature of the nine divines some more, but I still feel as though their primary purpose is missing; the role they play in the game. Just a rather spontaneous thought upon reading NathanJ's quest ideas, but what if the Imperial Cult were to face a series of tribulations that were all vaguely linked to the Daedra of Morrowind; not some sort of conspiracy between the Daedra to chase the Aedra out of Morrowind or something, but rather to represent the harshness of the land (the Four Corners of the House of Troubles) and the harshness of the people (The Tribunal and Anticipations) turning away the ill-adapted foreigners. So one Adept might go off the deep end and end up trying to bump off Temple priests for misleading the Dunmer, (Antellius and Sheogorath), a group of cultists might riot against the local Dunmer with harsh repercussions (Mehrunes Dagon), a group might be so utterly shunned by the locals that they close off inwardly and stop proselytizing (Malacath), a scandal might erupt over certain high-ranking Imperial cult members misusing their authority to make their followers bend to their will (Molag Bal), striking a heavy blow to trust in the cult. On to the good Daedra, a Temple faithful challenges an Imperial Cult champion to a duel and the champion rashly agrees, putting the Imperial Cult in an awkward spot (Boethiah), the Imperial Cult is drawn into a delicate political situation in the vein of the Thirr River Conflict and risks offending one or several factions they can't afford to offend (Mephala), and a movement within the cult develops from preachers who became swayed over to the Temple, whether through viewing acts of charity, through theological introspection or through disillusionment of the Nine Divines, and essentially start undermining the cult from the inside (Azura). On the other hand, the Aedra would support the cult faithful and help to counteract the damage. Perhaps in the end the player will appear to have provided a foothold to the cult in Morrowind, but in the end only served to exploit and contribute to the weakness of the Temple and essentially contribute to the 'breaking' of (Tribunal) Morrowind. Rather an extreme direction to go, but I figure at worst it might start an interesting discussion. I always thought that the Aedra play a far lesser role in the TES games than the Daedra lords - strange enough, the anuad sais that the daedra have far less interest in the plane of the mortals than the Aedra. I think these are really strong ideas, they perfectly fit into the characters of those daedra lords. Its hard to find a fitting quest for azura in this context though, because she is one of the two (with meridia) daedra who really seem to act with discernment and not only for their personal amusement, so in my opinion azura wont act destructive towards the cult - why not some kind of cooperation, azura and the cult/the aedra? Lets say an oracle had a vision of a missing, almost died of thirst, inside of a distant mine. The player has to save him and it turns out that he is a champion of azura, on a mission to do something. The player helps and gets in touch with azura through that quest. But the idea itself, some people are not happy with a few things inside the cult and try to change that - I always love those ideas, especially when we give the player the chance to participate in a religious controversity. Why cant I simply use an Elder scroll to make my Clocks go slower? Azura was the god-ancestor that taught the Chimer the mysteries needed to be different than the Altmer. And Fadomai said, "When Nirni is filled with her children, take one of them and change them. [...]"
As well as, of course, the story of Morrowind. She is not benevolent. The Dunmer are her people, and the Khajiit are her people, and she is generally not antagonistic; she gets people to follow her plans, and as long as her plans are followed everything is alright. She is incredibly hostile towards any who threaten those plans, however, and by proxy any who mess with the pawns she has chosen to carry out her plans. The positive aspect makes her a protective guardian of her worshipers, the negative aspect makes her perhaps the most singularly vindictive being in the Elderscrolls universe, and one of the most manipulative. To the Nerevarine, reincarnation of her champion, who is tasked with removing the affronts to her very nature that are the Tribunal and Dagoth Ur and tearing down the perverse, insubordinate society they created, she appears benevolent. But a cult worshiping other gods trying to worm its way into the land of her people would encounter her other side. In general, all of the good Daedra are plotters, but to different ends: Mephala plots for the joy of plotting, and the means justify the means. Boethiah plots for the joy of bloody revolution and uprising, and one could argue that, for him, the means justify the ends. Azura plots to control the flow of events, and for her the ends justify the means. Though at this point it bears repeating that Azura isn't necessarily going 'that Imperial Cult is a bother; let's undermine it'. What is important is not her trying to counter the cult, which she may not be consciously trying to do, but rather that through her passive influence on the Dunmer people the cult is getting undermined. She, Boethiah and Mephala spent years essentially programming Velothi society to behave in the way they wanted it to, and even the Tribunal could not remove that, rather electing to superimpose themselves onto it. It might be helpful to see Azura less as a figure and more like the Velothi equivalent of a cardinal virtue to the bad Daedra's cardinal sin. Dunmer society is simply incompatible with the Imperial Cult, and for the Imperial Cult to establish itself one of the two needs to change. Azura's influence ensures that attempts to undermine Dunmer society are themselves undermined. The Aedra are incredibly invested in the mortal realm, unlike the Daedra. So invested they sacrificed themselves to create it, and are essentially dead. They play a huge role, but passively, as they basically form the skeleton of the world they created. (The Earthbones). Through essentially being dead, however, their ability to act is very limited. In Morrowind, you ran into four or so avatars of Divines, which is what I was referring to, counting Wulf. Such appearances already seem to be on the extreme end of what the Aedra can manage, and they probably only bother because they seem to have their own plans for the Nerevarine. The Daedra face no such restrictions -- except for a deal they struck with Sotha Sil to basically not invade Tamriel -- and as such could essentially pop around in ghost form as Azura does in Morrowind as much as they please and engage in all sorts of hijinks, but being less invested in the mortal realm can't be bothered to fully exploit their freedom, though still making liberal use of it. "Azura is the only Daedra Princess I have ever worshipped who seems to care about her followers. Molag Bal wanted my mind, Boethiah wanted my arms, and Nocturnal perhaps my curiosity. Azura wants all of that, and our love above all. Not our abject slavering, but our honest and genuine caring in all its forms. It is important to her that our emotions be engaged in her worship. And our love must also be directed inward. If we love her and hate ourselves, she feels our pain. I will, for all time, have no other mistress." Strange, if I understand this correctly she is narcissistic (for example in azura and the box she is ashamed as hell about her inability to know the exact thoughts of that dwemer-scientist) and jealous (as indicated above, she wants to take part of every emotion, especially love, her worshippers have to be completely devoted to her). But she still cares about the Dunmer even after the apotheosis of the tribunal and dagoth ur and after she cursed the dunmer with their new appearance. I still believe there is some benevolence inside her, like a tendency among others. I imagine her as a proud queen who loves her people with the soul of a pubescent only child who wants everything for herself and doesnt ever tolerate any protest. I think that, if viewed from the right perspective, she's certainly very benevolent, but in a sort of very autocratic, suffocating fashion. She sets the terms in a relationship, and as long as you keep to those terms she will treat you well. She expects unconditional devotion of her subjects; that they essentially behave as drones to do her bidding. She demands loyalty. As long as they don't disobey her all is rosy. While she does care about the Dunmer, I think it's on the level of the Dunmer being a precious toy that has been stolen and played around with. She wants the toy back, and to punish the ones who took it, but beyond that things get very complex; to some degree she probably resents the toy and largely only wants to take it back to prove a point. On the other, she may want to cherish the toy as she had before, and keep it close, and never let anyone else get their grubby hands on it again. I like where this discussion is going. The Imperial Cult often gets perceived as a rather dull faction (I've been guilty of this in the past), so it's great to see ideas getting put forward to give it a defined purpose and direction in our mod. Although I think the characterization of the dunmer as a simple toy goes too far, maybe youre dead on. That means what you originally considered as possible quest for the IC would maybe fit into the context. The only danger I see is if azura is portrayed too stubborn it could let her look weak. So when quests are designed that include her I would let her appereance be a bit aloof, mysterious and of course powerful. I think Azura is in an especially strong position in Morrowind, being one of the central figures in the narrative even if she's generally consigned to the background. She is essentially the player's guide; she opens and closes (see what I did there?) the narrative. I think we'll have ample opportunity to explore her various facets. I do think we'd probably actually want to focus on her more positive aspects as, again, for Morrowind and the player she mostly presents herself benevolently, but the Imperial Cult might allow for the player to get a short glimpse of her as seen from the other side of the fence. Sounds great. I think ill come up with more concrete ideas for the IC-questline(s) soon, if thats ok.
Hi guys, ive got some raw design of the IC as a whole. I hope it will help this discussion and the faction to take form . -first of all, we have talked about the actual influence and power of the aedra and that they are very limited in their options of doing things directly - thats the practical difference between them and the daedra. Therefore I imagine a kind of subtile style of "reign" over the world and the cult. Why not a connection between the earth bones and living spirits, while a certain person is considered good and just in the eyes of the gods until he decides (or is entrapped) to do something bad - and by this action he gains the attention of the daedra? So in this first case the influence of the aedra on the world is in fact a subconscious tendency of all living spirits to be good. Thats my suggestion, to be discussed. The second case is the direct communication to "prophets", oracles of the cult for example, but not necesserily, because I believe "chosen" people are made oracles after the cult realizes they have the talent granted. One important point (maybe to discuss too): My opinion is that while the emperor and the government have the duty to reign over the more practical and political things, the gods reign by using the cult in a subtile way over the "pureness of hearts", that means over the honest life in the nine virtues. Thereby they secure a certain style of government - and thats one of the ways they rule at least tamriel (see above the other one, the earth-bone-soul-connection idea). I had this idea after reading that old thread about the oracles. So how does the cult look like? One idea of mine was, after I thought that a person can interprete a single deity in different ways, to split the cult in at least nine single shrines, each one dedicated to another deity (also interesting would be two shrines dedicated to the same deity - seen different in some special cases. The two would almost tear each other with theological argumentation ). Each shrine has at least one questline. The "Headquarter" would be a huge cathedral in or near old ebonheart, dedicated to the nine (or akatosh? ), with the "archbishop of morrowind" (there are archbishops - words and philosophy) and the nine shrines would discover different aspects of their deities in their questlines. -Do they (only) believe in the nine divines? -Do they accept the nine virtues as foundation of a good lifestyle? -Do they accept the empire as divine planned and governed institution? Akatosh: Since he is the god of time and the chief deity, I would do something with fate, providence, divine planning for history... Maybe here is the strongest possibility to depict the aedra operating in nirn. Kynareth: Why not a shrine which does church service on the roof of a hlaalu house? Then the obligatory player-go-and-safe-the-nature-quest (Oh, no, they want to uproot those trees) - or is that too much of a played out joke? Zenithar: In his quests I would concentrate on diplomacy and communication. The ultimate goal of Zenithar is peace, and his followers reach that goal through fair trade and honest deals. So maybe his questline concentrates more than all the other aedra-questlines in pacifying conflicts between people by offering a solution that is acceptable for every party. Stendarr: Stendarr means authority of law and government. So far so good. Maybe it is possiple here to connect the cult affairs with the ones of the government. OR this quests concentrate on the gaps, the places the worldly law cant reach and only a divine spirit can know. For example a rich and influential noble commits a crime and remains unpunished because of his overwhelming power - from stendarrs prophet/oracle the player gains the knowledge about how to get the noble to admit his crime. Julianos: See my Marcus Antellius thing in my showcase, it contains every idea i have for this one. Dibella: For this i had the idea of a shrine which sees its deity from a very mystic perspective, the shrine members are young, beautiful, mostly female. The church service concentrates on worship and the community, lesser on scripture reading or something like that. Even body contact plays a role, but not sexuality (though I could imagine an amour between shrine members). Talos: I considered a shrine similar to a knight order. A community of religious mercenaries, on and off fighting together with the legion or the fighters guild - or only for themselves, sophisticatedly deciding where and for what it is worth to fight. They have a complex system of ranks and honorary titles. Well, so far the single god questlines, further I had the idea, to include Gnomeys Daedra-vs-IC-quests in another questline which is kind of a climax of the IC-questlines. My idea was to have, as said above, an archbishop in old ebonheart. I currently work on this character. Remember saryoni, tribunal temple? He becomes available as quest giver at the very end of the temple questlines, and the IC-archbishop would be similar. His questline becomes available when all other IC questlines are finished - and because of the enormous dimensions of the tasks (a battle between gods so to speak) those anti-daedra-quests would perfectly fit into that final questline. -Well, the idea with the connections of earth bones and living spirits - it would be an addition to existing lore as how I see it. Maybe to discuss or to neglect. -On the idea of the necromancer-hunter, necromancy is not forbidden in the empire, the empire even supports it indirectly by giving corpses to wizards for "research". On the other hand lore (see the book "arkay the enemy" and another one which name I forget which is telling how the undead were created, by a daedra lord (molag bal? He created at least the vampires) and arkay "was sad but coudnt do anything about it", plus the dialogue of IC-mambers about arkay) sais that arkay is the enemy of all necromancy and undead. In this case there seems to be a inconsistency between two emperial institutions, government and cult. -The "direct communication" I talked about above happens in fact in form of more or less cryptic visions and/or prophetic texts. First up, don't worry about not being a developer. We do not expect our writers to be developers; you only really need to be a developer if you want to contribute CS work. Sorry. I'll do no business with one who bears the mark of Zenithar. It's obvious you've sworn an oath to Zenithar you've yet to fulfill. The nature of the 'mark' is never made clear, however, and in another quest in which the PC swears an oath to Zenithar there are no such restrictions. I think on a practical level your take on the interaction of Aedra and Daedra and good and bad is correct. To Imperials, the world is basically Aedric and good by default, but is subject to corruption by the Daedra. As far as oracles are concerned, I do imagine the Imperial Cult very specifically being the missionary arm of the Empire, and probably about as beholden to the Empire as it is to the gods, though naturally from the perspective of the Empire it's the same thing, the Empire and Emperor ruling through divine mandate. In practice, though, I think it's true that devout worshipers of the gods, whether within the Imperial Cult or outside of it, would be closer to the gods, and if the gods wished to act directly rather than through the Empire they would tend to do so through cultists such as those in the Imperial Cult. In fact, I think certain Divines choosing to interact directly with the Nerevarine is a sign of that. I think your idea about balance between the Empire and gods works better in the Imperial province, where rather than the Imperial Cult you have a myriad of cults often devoted to specific Divines. Only a small fraction of those cults would probably be directly incorporated into the Imperial power structure. Where do archbishops fit into this? They don't really; there's only one: the Archbishop of the One in the Imperial City. And the monotheistic Alessian Order which gave the Temple of the One its name was very much the opposite of the plurality of religious thought that has taken hold of the Empire as a reaction to it. If there are other bishops, I'd expect them in places where worship of the Nine is well-established, and likely unrelated to the Imperial Cult. I don't know whether they would simply represent especially influential cults or churches or whether they would represent an attempt by the Empire to exercise some form of control over the overflowing religious anarchy. A complicated question when it comes to the Aedra is how conscious they actually are. Does an Oracle hear their words, or does the Oracle's understanding align so strongly with that of a particular Aedra that the Oracle gleans a bit of the Aedra's understanding? Is Akatosh a dragon, or is he only the flow of time as perceived as a dragon? There is a Grand Chapel of Talos in Old Ebonheart, and the Primate (highest rank) of the Imperial Cult is based there. While I think that shrines can have a specific focus, and naturally the NPCs within can have their own particular devotion, as an organization I think the Imperial Cult should be very uniform. Any one chapter will tend to have NPCs of different devotions, and will generally try to cater to all of them. Something to keep in mind is that the Imperial Cult would have very little territory. Mostly, shrines would probably be one-room affairs as in the vanilla game, crammed into the odd Imperial fort or Hlaalu house. I do like the idea of attending to concerns of particular divines, but rather than doing it on a shrine-by-shrine basis I'd either divide it by individual questgivers or simply by quest. I am not, however, convinced that all of the nine divines need to be represented. I think the seven Daedra should be represented to show the unity of the land and its people against outlanders, as I said, but I actually think a similar representation of unity among the outlanders might in fact be detrimental. Morrowind is thematically a place the familiar can't quite penetrate. As far as Arkay is concerned, some interaction with Dunmer might be a good route, exploring their different practices but also what they have in common: their shared dislike of necromancers, but the Dunmer acceptance of their own brand of ancestor-necromancy. Indeed, there's a discrepancy between Arkay and the Empire as to necromancy, and in some ways the Empire's tolerance of Morrowind's own necromantic practices are an extension of that. The Imperials will have no doubt found either a justification or, perhaps more likely, a compromise, just as they see Daedra worship as an 'acceptable blasphemy'. Kynareth: I treat the reference to Kynareth preferring worship in the great outdoors as a bit of weaseling on Bethesda's part about not having had a cathedral of Kynareth in Oblivion, which I suppose would have gone in Sutch or something. While more the case with the Redguard and Nordic pantheons, Kyne is often associated with sailing, so I'd tend towards placing content related to her near ports. I'd leave off of nature altogether; movement, searching, wind... Maybe think Hermes of the Greek Pantheon; a fleet-footed messenger. Talos: I'm not much of a fan of this idea in particular, due mostly to the scale of most shrines. Even if the Grand Chapel of Talos is probably going to be the largest Imperial Cult shrine in Morrowind, it's not really very big. The Imperial Cult is really a very minor faction, and has not yet succeeded in establishing itself in Morrowind. Given future events, it likely never will. Talos is the champion of men, in an archaic and unspoken way against the elves, so I rather see potential in exploring the interaction of the Imperial Cult with the Dunmer, who, it should be said, are themselves at odds with other elves, as discussed at the tail end of Anonytroll's text. I do think it would be interesting for there to be individuals who worship the nine outside of the Imperial Cult, who the player would have to convince to integrate into the Imperial Cult hierarchy, but I'm not sure about whole groups; maybe in Kragenmoor and Narsis. As a last point, we will be discussing Quests in the Skype meeting this Saturday, at 6:00 PM GMT/UTC. I'll try to be quick with carrying over the results of the meeting to the Master Plan document; I still have a week of vacation before me after all. As far as story structure is concerned, if we keep to something similar to the structures I discussed in the recent thread, which I imagine we would if only to remain consistent with the structure of the vanilla questlines, I rather think the Daedric quests might work better spread across the Imperial Cult questline, as seemingly isolated incidents which come together to form a far more threatening whole. If we go with the ring structure approach, they might be the kind of threads that appear early but the player would only be able to fully resolve after 'undoing the knot'. There is a Grand Chapel of Talos in Old Ebonheart, and the Primate (highest rank) of the Imperial Cult is based there. Wait, Primate is only the highest possible rank of a lay memper. There is a dialogue from a IC member that sais that to become a priest or cleric takes all of the time and capacity one has (living in a monastery and such), and therefore he can only offer the status as lay member, who can work as lay healer, lay servant and so on - the only possible job for an "adventurer like you, who travels a lot". Ill try to find that dialogue... But that means there are priests and clerics in the IC. First of all, Im a big fan of "unity in diversity", and my idea is to present an imperial cult which consists of more or less different societies (the shrines) which consist of people with different races (mostly imperial, but also converts), backgrounds and views of life. Everyone of those has his own reasons to believe in the nine and his own special persuasion - and if it is only to believe what the preacher (preacher? how does church service work actually?) says. -Focus on specific questgivers with maybe one or two favourite deities (or some favorite opinions of them) plus the design of a shrine with the dynamics of a real church (theological differences, disputes, public relations, mission). -Something like a "network" between every shrine counting itself as IC-shrine. There has to be something like a leadership, I believe its worth a look how this hierarchy would look like: See for example Iulius truptor with that donations-thing. Someone necessarily has to decide where this money is spent on, look where and how much money is needed, and so on. That takes a lot of communication and together with the numerous other remits in the IC it almost naturally builds up a certain hierarchy. But I still dont know how this looks like in morrowind... We must admit, there is not much information about the IC in the vanilla game, so we have to dig. At least I will do that, see my last post in my showcase. On the Skype meetings, I dont have skype yet, but I will maybe download it and participate in one, but I’m not making any promises. It is not possible to become a priest or consecrated cleric without joining cult orders. You would be forced to devote yourself full time to the Imperial Cult, which doesn't suit adventurous people like yourself. But we do need lay servants -- earnest laymen dedicated to serving the Nine -- for certain unglamorous but spiritually rewarding tasks. At present we need almoners to serve Zenithar, lay healers to serve Mara, and shrine sergeants to serve Stendarr. You have already risen to the highest rank available to a lay servant of the Imperial cult. Wow, you're right, I completely missed that, probably in part because all of the NPCs use the lay servant rank structure. (Bethesda didn't bother making an NPC-only faction). That's something to chew on; should we figure out a separate NPC hierarchy? Of course, For My Gods and Emperor is probably the single most important source for the Imperial Cult, but it's more of an in-game manual than straight-up lore text, and is clearly geared towards lay members. Hm. As far as unity in diversity, I think I can agree in principal, but think we need to be very careful how it comes over in-game. I think that, as an organization, the Imperial Cult should seem very, well, organized. Maybe go with a top-down approach where the hierarchy is strict, uniform, perhaps bureaucratic, but loosens up as it descends down to the individual shrines and members? I do think the Imperial Cult's identity as an Imperial institution rather than a grassroots, independent religious cult is important and worth keeping, though; I think it provides the potential for it to develop in a really interesting direction. I certainly don't want the faith of the Nine Divines to tread too closely to fantasy Catholic church territory, which is a constant risk and, as far as the earlier and later games are concerned, a reality. (Naturally the Catholic church inspiration is really heavy in Morrowind as well, but, as with many aspects of lore, I think Morrowind-era Bethesda was making an effort to diversify, and I think it would be a pity to not continue in that direction). Beyond that, I still doubt shrines will be large enough for proper internal politics within shrines; again, most will probably only have something like two or three members, and then there would be a handful of somewhat larger shrines with probably something like five members. (The two Ebonheart chapels -- Old Ebonheart, of course, being the largest Imperial city in Morrowind by a good margin -- have, at a quick glance, seven members each). With such numbers, you'd only really get individuals butting heads within shrines. Yes, I also think that we have to try avoiding the cult becoming a catholic-church-clone. On the other side the catholic church is the main inspiration for the cult. As with every fantasy-idea that is based on something real, the fantasy-idea must have something that makes it different, using the main inspiration as source for the overall vibe and different ones to guide it to a direction that has never been taken before. Its like taking a piece of meat and using different spices to make a new special combination of flavors. So to show an IC that is really the TES-specific religion it is meant to be, I think its helpful to point out the differences between the IC and the church. -There is no real "punishment" for unbelievers or sinners. If someone wants to serve daedra, he can do it (though many daedra claim souls for themselves, like molag bal (coldharbour) or hircine (the werewolves)), as far as I know is aetherius the place everybody goes to when he dies, not important how good or bad he was. Youre right with the problem of the number of shrine members. I had that thought earlier but I simply couldnt face it ^^. Well, the chapel in vanilla ebonheart anyhow has 7 members. For the talos-chapel in OE we could extend that to maybe 10. With this number I think we could do something, nothing really big, but a little. Nah, I think having two player factions would be redundant. I think the focus should be that 1. the stuff the other hierarchy does is uninteresting for the player and 2. even as a layperson, the player can reach a really influential rank. If the clerics and priests are mostly dusty bureaucrats who sit around, handle cult organization and accounting, study religious texts, perform the occasional ceremony, and then the lay members are well-suited for Morrowind, ranging far and wide actively aiding the cult and doing important stuff with a clear impact, I don't think people will be particularly bothered. At worst, there will be mods for that, just as with the vanilla NPC factions. I think the major influence Morrowind tried to pull in for the cult is the Roman approach to religion, but I must confess I'm less familiar with it than I am with Catholicism, other than that their religion was tied to the state to some degree but they were also mostly tolerant and allowed or even encouraged a wide array of cults, often from foreign pantheons, to flourish. Generally, as with the Dwemer, I'd say proper subversion of an overdone trope might lead to interesting results, but frankly I think the Catholic church has been played straight and subverted in so many different ways through various media and even within TES that we either need a very fresh perspective on it, for which we probably lack sufficient knowledge, or would be best-served to forge out in a different direction. If the meat's overcooked, you either need to heap on the spices or find yourself a new slab of meat. I find the issue especially awkward because, despite being very different in appearance, the Tribunal Temple also takes a heavy dose of inspiration from the Catholic church. Services are unusual; devout cult members generally don't sit around listening to someone preach. They lay offerings at the altar, take part in various cult rituals, raise private prayers to the Divines throughout the day whenever the situation lends itself to doing so and, when their concerns are greater or more immediate, seek advice from the local priest. Another that's less making stuff up: the cult relies mainly on offerings rather than tithes, which I'm not sure exist outside of maybe High Rock or something. Which in turn sort of reinforces the idea that worshipers don't just sit around and pay taxes, but actively take part in cult activities and spread the wealth that way. Youre right, it would be strange if the PC is lay member AND cleric. The thing disturbing me at this point is that he cant really be a "leader" as with the other factions (because the main thing that makes TES different from other RPG-series is the possibility to join a faction and rise in hierarchy until one becomes the very leader of the whole thing). Imagine an NPC saying this: "Do you want to join the cult? Well, there are two ways an outsider can take when joining the cult, but be warned! Once you have chosen one, the other one will vanish! So the first one is suited well for adventurers like you, who travel a lot, it is the way of the lay member. On the second one you will be forced to devote yourself full time to the Imperial Cult and it will take much of your personal freedom - the way of the monk." So its a little bit like the thing with the great houses. Hi, I wanted to release my first thoughts about the IC - questlines, together with some first lore-extensions. The imperial cult is divided into four subgroups (or philosophical trends with charismatic representatives), the godlead, radical, liberal and the puritan. The godlead are not officially called like that, but it is known that divine interventions like visions dont happen so much in the very cores of the radical and liberal - they trust more in the own logic and convictions than in divine contact. While the player rises in the hierarchy he/she "joins" one of the four subgroups and at the end, of course, replaces the primate as representative of his/her subgroup. 2. Advanced, "bigger" work that comes from the IC as institution. Thought as link between the time the player is just a member of the cult and the time when he is associated with a subgroup. The current primate of morrowind is part of this subgroup, together with his personal oracle. The godlead try to stay close to the will of the gods by constantly expecting their speech through visions and signs. Also the godlead are the very largest group in the IC and the one with the most political power inside the cult. If a godlead becomes primate (just as now), pretty much everything stays as it is. The radical believe in the priority of the faith in relation to ethical good acting. They are the only subgroup of the IC that has a clear imagination of the "right/good" faith and the "false/bad" faith(s). This is against the official opinion of the IC, but the radical rarely admit that, they mostly try to whitewash that when asked. "The one who does good acting and serves molag bal will show that bal is a good god and gather people around him. The result are souls imprisoned in coldharbour, crying and regretting their false belief in their mortal lives. The one who puts the belief to the nine first and tries to build up faith in the hearts of the people around him will set up the basis for souls that remain safe even when death is coming. So we see, that good acting can be deceiving if its connected with the wrong faith. Stay faithful to the nine, and you will be safe and sound in the long term, even beyond death itself"
The radical are mostly missionaries that are arduously trying to convince the people around them of their faith. The most brash even tend to put the relationship of the empire to the native people of the provinces at risk. If a radical becomes primate, lay healer will become less important and missionaries will become more important. The radical want the IC to be a proselytizing-machine. Faith serves the benevolence that is in every human and mer, not important about which religion we are talking. The liberal accept the imperial cult as the religion that implements that benevolence best, but grant every other faith the ability to educate its believers to good men and women. While this is not against the official opinion of the IC at all, the liberal slowed down the plans of the cult in the past, when it came to converting natives, and tried to get ressources flowing into areas where they were - like the liberal said - more needed. "A man can be good or bad. Our cult means the good. But what if someone execrates the nine, but his deeds are good, which effect does he have on the world? A better one as the one who worships the nine but does deeds that are evil." If a liberal became Primate one day, the ICs politics in morrowind would become very different. There wont be many missions to ashlanders anymore (while they cannot leave them entirely). But more schools. And doctors. The puritan believe in the gods wish to manipulate the world directly by their power, and the ability of their believers to strengthen the gods by using continuous prayers and ritual purity. They mostly live reclusively and remain passive in political changes in the IC. The puritan think converting in the "classical" way is good, but the gods will manifest themselves in visions or signs IF they have the power to do that and will make conviction by a discussion with a missionary unnecessary. The same story with the good deeds the IC does: The Puritan believe that the gods will change the hearts of the pagan IF they get the power to do that. So they gain control over the world by using the power their believers bring them. Because of their passive nature, the puritan have proven themselves as unwilling to proselytize. Also they are not that active for example as lay servants. The only thing a convinced puritan wants is time to pray and abstinence, which works best with a lifestyle away from big cities and the temptations of the world. Puritans often come together in small fellowships to help each other to keep up the lifestyle. If a puritan became Primate in morrowind, he would build monasteries for the IC-members, where they can pray and stay pure. Great, thanks for reminding me. As I said, these are only my very first thoughts about that matter, it will become more specific (and complex, I will include Infragris' portrayal of the cyrodiilic religion) as time goes by. One of Infragris' texts with a few comments on how my design of the IC is linked with the cyrodiilic religion. First of all, the IC in the provinces has a different purpose than in Cyrodiil. The IC in the provinces tries to bring the imperial faith to the native people, so it tries to convert people, the cyrodiilic IC doesnt, thats the main difference. It (the provincial IC) is lead by the primate, which should be one level under the emperor (but the primates of the provinces might form something like a council). The state religion of the Empire, worships the Nine Divines, eight supreme spirits who sacrificed themselves in the creation of the world, joined by the spirit of Tiber Septim who founded the Third Empire. Omnipresent in Imperial affairs, but also considered a cold and distant faith by those that are not part of its priesthoods. Consists of the Orders of Akatosh, Arkay, Dibella, Julianos, Kynareth, Mara, Stendarr, Zenithar, and Tiber Imperator. Each is also supported by a Knightly Order: in order of appearance, the Knights of the Hour, of the Circle, of the Lily, the Knights-Mentor, the Knights-Harvester, the Knights-Pilgrim, the Knights of Iron, and the Red Templars (the last make an appearance in Morrowind, associated with the Legions). There are also various lesser Convents dedicated to specific aspects of the Divines scattered across Cyrodiil. The Imperial Cult considers the Emperor to be the head of their church. I like what you have here. Honestly, I never really gave the Imperial Cult much thought before now, but having it mix well with the other province mods sounds fun. I do think you're right about the IC mission being different in the sense that within other provinces it's bringing the natives to this new faith. However, (and I could be totally wrong here,) isn't the Primate an attainable rank for the player should he choose to join the cult? I thought you only had the option to be a lay servant which performs certain tasks for the cult but ultimately serves as only one branch of the faction. It's been years since I've actually played through Morrowind so I can't remember, but I do wanna say that they mentioned a rank somewhere within the game text that was unattainable by the player because it's for full time priests...or something. Anyway, this is just random pondering on my part. I do like the idea of there possibly being a council made up of the equivalent of Primates, but I think it should be fleshed out a bit more. Hello! Glad to see these texts are useful for something. For Cyrodiil, the idea was to have a council of nine (Arch)primates known as the Ennead, representatives of each of the Great Faiths, to govern the Imperial Cult in name of the Emperor (who is the ultimate head of the Cult, Church of England-style). The player would ultimately be able to take one of these seats for their chosen Divine. The missionary arms, as I see them, would be organized by the Ennead, but only indirectly connected to the convents. Each missionary branch is controlled by a Primate with a great degree of personal power and freedom. The Cyrodiilic Cult is preoccupied with Heartlands politics and internal theological disputes, giving only cursory attention to what the missionaries are up to. @Not: I can't remember if the player can fully ascend the ranks, but the highest-ranking NPC on Vvardenfell is an Invoker, a full two level beneath the rank of Primate. This suggests that there is only one Primate in the whole of Morrowind. Also, a small note in relation to the quoted text: we've since decided not to refer to the knightly orders, since they are rather Bretonnic in nature. There will likely be noble circles dedicated to specific Saints of Cyrod, however. This would be so much easier if I had played the game recently. Basically within the cult itself you can be a lay member, which is a certain arm of the cult but not part of the priesthood where I guess you could say the true authority lies. Bethesda didn't make a specific NPC only faction to reflect this so I guess you're pretty much the highest ranking lay member within Morrowind. Honestly, I really don't think it matters either way, it's just another reason why I need to go back and play Morrowind again. Anyway, I like the idea that the player has to choose a Divine and I like what you've done with the lore so far. I think TR can help incorporate that when we eventually get to the Cult and it's activities. Edit: To clarify what I said earlier, I was merely pointing out that vanilla morrowind had it to where you could only be a lay member, NOT that you guys should restrain yourselves to that one notion. I like what you guys are doing with it; taking a boring faction and making it interesting. I couldn't care less what vanilla did with it, but I am excited to see what new and amazing ideas you all come up with. Whatever you all decide, TR will make sure to keep with the lore so nothing conflicts in the end. The "lay member" thing shouldn't be a problem at all, I think. You can start the player off as a lay member, same as the vanilla game, and later allow them access the inner cult through a "Divine revelation" of sorts: a vision, visitation, or oracular prophecy from the Divines themselves, appointing the player as their representative and bypassing the normal hierarchy. The idea behind the lay membership thing seems to be that they could use basic fetch, kill, and find quests: being a full member of the cult would mostly involve praying, teaching, meditating, etc. Not a lot of fighting and exploring. Nothing wrong with that, but I think that, with a bit of imagination, a questline geared towards dialogue and political/theological intrigue could be very entertaining as well. That actually seems really appealing to me. Are you guys going to input a specific cutscene for each divine? Or just do the dream scenario text? Nothing wrong with that, but I think that, with a bit of imagination, a questline geared towards dialogue and political/theological intrigue could be very entertaining as well. That does sound intriguing I'll admit, although making choices involving 9 different Divines...I'm just glad I'm not the one implementing that. Although, the replay value would be incredible. You guys clearly put a lot of thought into this. That being said, is there anything specifically that TR should know about? Because I figured for the faction quests for example, it'd be more like "you hear to join the Cyrodiil Mages Guild?" Or something to that effect, so I imagine that when TR gets to it we could keep up with that. I'm just not sure if you want the Cult specifically to have that kind of branch or not. It just seems universal throughout all the provinces. Just as I can't really see the Temple faction leaving Morrowind. - Gnomey had the idea of the anticipations (azura, boethiah, mephala) of the temple actively doing something against the dunmer people being converted to the IC. The background of this is that those daedra built up the dunmer society to a certain point over thousands of years and are not amused of a new cult gathering followers in their "domain". - Same with the temple. They say they dont actively try to convert people, but some foreign cult with completely different customs and thoughts trying to convert dunmer shouldnt be a thing that they are amused of. - The primate in reality is a rank in roman catholic and anglican church and is always a formal rank for (arch)bishops that grants organisational power over a certain (geographic) area. Every church divides its area of influence into parts, and each of those parts is organized/presided by a primate. There can be many bishops, even archbishops in an area, but only one primate. (Note that some years ago there was a big political change in the roman catholic church that took away a big part of the primatial power). Are you guys going to input a specific cutscene for each divine? Or just do the dream scenario text? Most likely a dream scenario text. Ideally, I would like to depict some kind of dream vision with a unique cell and avatar of the Divine, but that might require too many dedicated assets. That being said, is there anything specifically that TR should know about? I think it would be best to follow the lead of the vanilla Cult, which (for once) can connect pretty well with the mainland. The missionary cult is quite independent from Cyrodiil or the other province branches, and highly adapted to the situation in a specific province. The only thing that should be equal across provinces (imho) is the Divine identity: their distance, the rarity of clear and direct contact, their use of oracles and imperfect manifestations, and their lack of a unified voice. The Divines are weakened spirits, more dead than alive, worshiped more for their sacrifice than their strength (the opposite of the Dunmer gods in that respect). Direct contact with them should prove elusive. And in that specific case, an over abundance for assets would be well worth it in my opinion. This is the Divines after all. Make them each feel unique and special. The main location for the cult in Old Ebonheart is obviously the Grand Chapel of Talos on the western side of the Plaza, with shrines for each of the Divines as well as relics from various saints. His eminence Strixus Sorvilius, the Primate of Morrowind, can be found there. The cult also runs the Hostel of Stendarr's Mercy on the Craftsmen's Street. At the Castle they have their own shrine for the Legion. A trap door in the Chapel undercroft leads to the age-old catacombs. The place is damp, dark and eerie, but that's also where the Hammer of Saint Kaladas, a holy relic, is kept. That's the only reason anyone would go there. The Guards Exemplar at the Grand Chapel of Talos? They are the Imperial cult's very own religious militia, recruited from among the pious soldiers of the Legion. They are fiercely loyal to the Primate, and will not hesitate to kill and die for him. I hear they chew the roots of a sacred plant that grants them keener senses and great strength. For years I have lived in this alien land and felt Kynareth's breath on my brow, seen Dibella's beauty in the dawn's sun, and loved and guided my lay brethren with Mara's kindness and Julianos's wisdom. Yet I have never felt even the slightest tingle from the self-proclaimed gods of the Dark Elves. What good are they, hiding in their crypt-like palaces? The Twin Lamps aims to help those who are being oppressed by the barbarious Dark Elven clans. I can not imagine a more noble cause. Lets say the player becomes morrowinds primate, how can he be member of the ennead at the same time (and vice versa)? My suggestion is to let this be a part of the game experience, as TES has always been like "yeah, you can be the leader of 10 factions at the same time". A compromise would be to use representatives of the player playing his role in the time of his absence. I would say the guards exemplar isnt so much involved in the cults internal philosophical struggle, there are members that like one specific philosophy more than another, but there are very few fanatics. IF we are going to tell an inner-political power struggle, would it be better to make subgroups more like one for each divine (or a group of divines) or the 4 philosophics (or a changed version of them) that I suggested? When one of those two is chosen, the other one would move into the background and loses its gameplay-relevance, it would be more like an atmospheric thing.